Wat Traimit is in Bangkok’s Chinatown district. 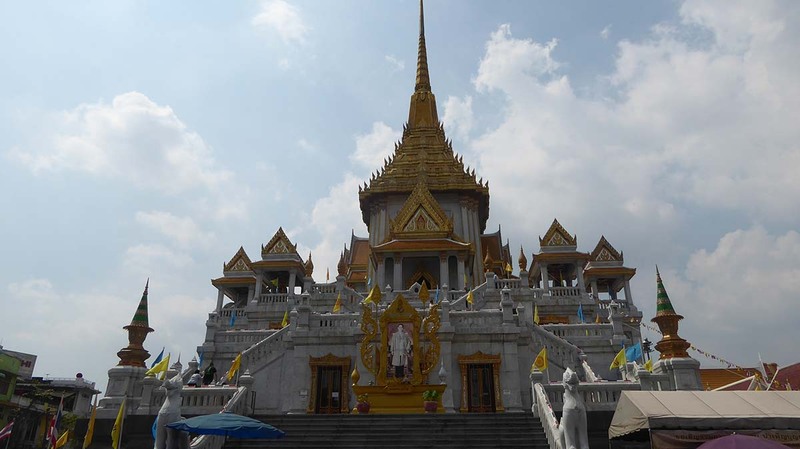 It is also known as the Temple of the Golden Buddha. 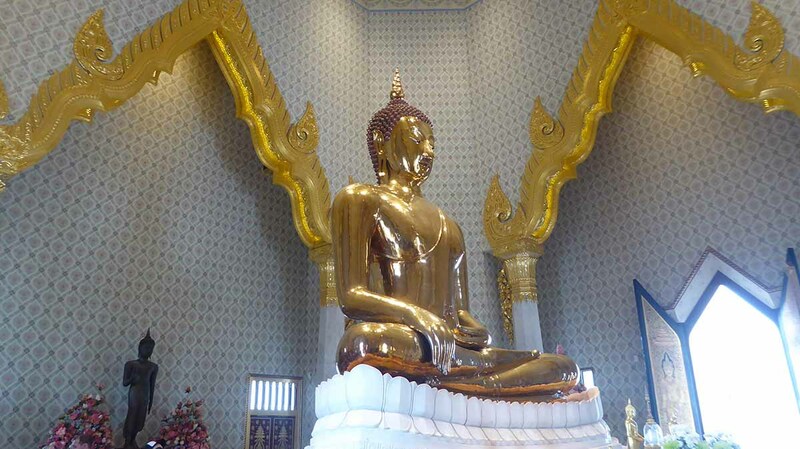 It is home to the world’s biggest gold Buddha image. The ancient Sukhothai period Buddha image is believed to be 700-800 years old. It is made from 18-karat solid gold, is 3 meters high and weighs 5.5 tonnes. The value of its raw gold alone is 250 million US$. The Golden Buddha has an interesting history. It was originally located in Sukhothai city in the 13th century before being moved to Ayutthaya around the year 1403. At some point before 1767, it was encased in plaster to hide the value from invading armies who sacked Ayutthaya. The image remained in the ruins of Ayutthaya until it was moved to Bangkok in the 1800’s. It was housed in Wat Chatonaram until being moved to Wat Traimit in 1935. Nobody realized what was underneath the plaster until it’s identity was discovered during renovations at Wat Traimit in 1955. It was accidentally dropped from a crane while being moved, breaking the plaster and exposing the gold underneath. 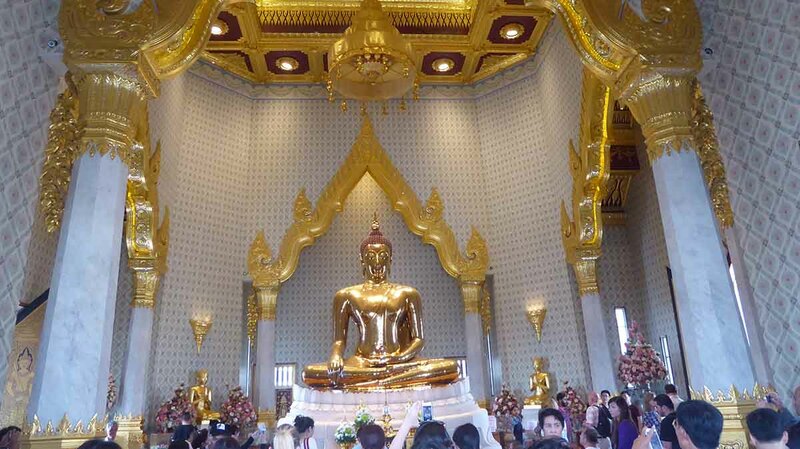 A new structure was built within the Wat Traimit complex in 2010 to house the Golden Buddha. It now stands inside a Mondop on the 4th floor. The building also contains an exhibition on the origin of the Golden Buddha. There is also the Bangkok Chinatown Heritage Centre. A museum which tells the story of Chinese immigrants who migrated to Thailand in search of prosperity. The temple is a short walk from Hualamphong station at the end of Yaowarat road. Location: 661 Charoenkrung Road, Yaowarat. 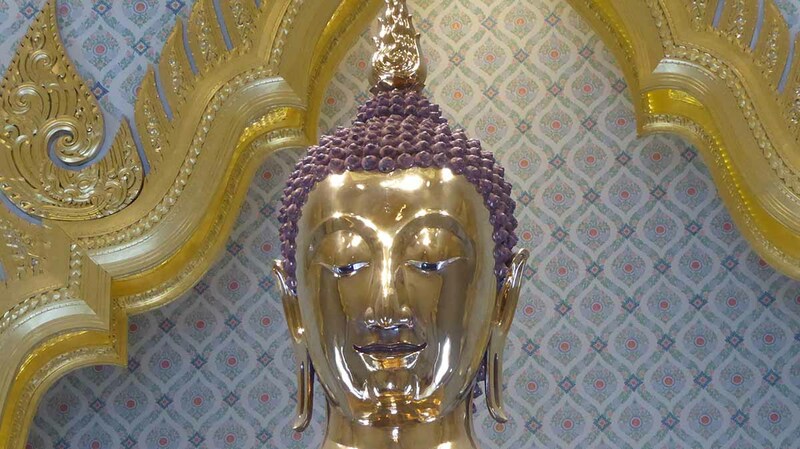 Admission: 40 baht Golden Buddha only. 100 baht for Museum only. Admission to the museum is free with a Muse pass. MRT to Hualamphong station, then a short walk.